Duct tapes are used for holding, color-coding, strapping, sealing, splicing, repairing and water-proofing and are pressure sensitive tapes with high tracking capacities. The tack adhesion and the material of the duct tapes outline its end-user industry use and grade. Increasing use of duct tapes for DIY activities in household use for repairing and strapping purposes is predicted to propel the duct tapes market during the forecast period. The ease of use of duct tapes instead of using glue and mastic fluids is additionally anticipated to contribute significantly to the market. On account of features such as, difficult contours and low tack adhesion on cupboards, duct tapes are applied as very efficient means for packaging goods. Application of duct tapes also comes in hotel industry for the purpose of securing protective sheets, carpets and paddings. The high tacking potential of duct tapes allow their use in marking and sealing in various end-user industries for instance, electrical and electronics, building and construction and many others. Vinyl and polyethylene material duct tapes are used for wide range light outdoor and indoor household applications. Duct tape market is anticipated to record a CAGR of 5.2% over the forecast period. Duct tape market is expected to reach the value of USD 4.1 million at the end of the forecast period. Many multi-national companies are concentrating towards new product advances in duct tape. Moreover, the many advantageous properties of duct tapes are exploited in the field of automotive and electronics now and then. New uses for duct tape are discovered on regular basis on account of increasing DIY activities which is expected to drive the duct tape market rapidly. Currently the global duct tape market is observing vibrant growth owing to increasing demand of industrial packing and sealing materials in the market. Advances in various end-user industries in the past few years and growing technological explorations are projected to drive duct tape market besides the wide range of functions of duct tape in an immense range of applications such as color-coding, water-proofing, sealing, repairing and more during the forecast period. On the basis of regional platform, global Duct Tape market is segmented into five major regions including North America, Europe, Asia Pacific, Latin America and Middle East & Africa region. The growing disposable income of the present population is surging the demand for automobiles which in turn is raising demand for duct tapes in the automotive market. Rapid industrialization and increasing economic development with thriving manufacturing sector is expected to boost the duct tapes market in the developing regions. Moreover, the rising demand for duct tapes is anticipated to increase on account of increasing urbanization with rising disposable income of the current population that are ready to expend on DIY activities across the developed and developing countries. 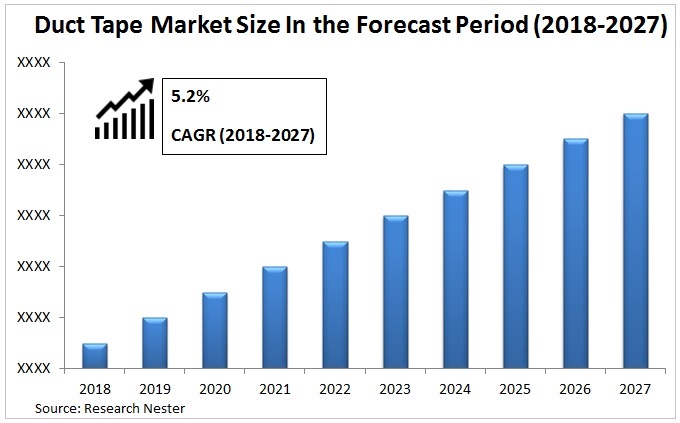 The demand for duct tape market is anticipated to increase on account of rising demand in various end-user industries for instance, construction, electronics, logistics, and others for repairing, strapping, packing, and water-proofing and many more purposes over the forecast period. On account of duct tapes holding high tacking potential, they can be used for the purpose of marking and sealing in general end-user activities. However, presence of industrial alternatives such as, other types of fiber tapes and mastic fluids present in the market is anticipated to serve as a leading factor in restraining the duct tape market over the forecast period. Beijing Yanuo Adhesive Products Co. Ltd. Pro Tapes and Specialties, Inc.